It would be a difficult matter for a well-read American to recall the names of more than four or five notable Indians, leaving, of course, contemporaneous red men out of the question. The list might comprise Pocahontas, best known, probably, for something she did not do; Powhatan, that vague and shadowy Virginian chief; King Philip, who had a war named after him and so succeeded in having his name embalmed in history; Pontiac, whose great conspiracy Parkman has made immortal, and Tecumseh. But, of them all, Tecumseh is easily foremost. He was a man who, had he been born to great position among civilized nations, would have stamped his name and fame upon the world. He was not a mere savage of the ordinary type, bloodthirsty, brutal beyond description, going upon one aimless raid after another to glut his passion for rapine and murder. These savage traits were not his, though all the good qualities of the Indian he possessed in double measure. He was fearless, he was untiring, and when once started toward an end he knew no rest until he had accomplished his design. He had a primitive dignity of thought and expression that marked him as a great orator. At the famous council at Vincennes, when Tecumseh had finished his speech and was about to sit down with his braves, the interpreter, pointing to General W. H. Harrison, said, "Your father wishes you to take a chair." But the ordinary courtesy of calling the white Governor the father of the red men was repugnant to Tecumseh, and with lofty mien and unpremeditated eloquence he declined the proffered seat. "No," he exclaimed, "the sun is my father, the earth is my mother, and I will rest on her bosom." And he sat down on Mother Earth with his assembled warriors, this act and fiery speech more than ever binding them to his fortunes. Tecumseh was in reality the first of the great Ohio men. He was a Shawnee Indian, and his tribe, in the middle of the eighteenth century, had emigrated from Florida to what is now the State of Ohio, Tecumseh being born in what is now Clarke County, near the present city of Springfield, in an Indian town that bore the name of Piqua. This must not be confounded with the present Ohio town of Piqua, which is in another county altogether, the birthplace of Tecumseh now being the site of a straggling village bearing the name, West Boston. In his boyhood there was nothing unusual. He grew up in the stirring times when Daniel Boone, Simon Kenton, and the other hardy Kentucky pioneers. Long Knives the Indians called them--were leading their forces into the West. It was a time when the Indians were constantly fighting. They did not live in Kentucky, but they regarded the fertile woods and prairies south of the Ohio River as their hunting-grounds, and they attacked with savage cruelty all the whites that dared to encroach upon this territory. The whites in turn crossed the Ohio in reprisal, burnt the Indian towns, tomahawked women and children, destroyed corn-fields, and were as unrelenting and barbarous in their revenge as their savage foes. Tecumseh defends the Whites at Fort Meigs. Tecumseh was born about 1776, and in 1780 the village of Piqua was attacked by a party of 1,000 Kentuckians, who, after a fierce battle, drove out the Indians and destroyed the place. It was amid such scenes that the Indian boy grew to manhood. In that wild time, war was the only science, and butchery the only trade that an Indian could follow. One of the favorite Indian pursuits of the day was the capture of parties of emigrants and traders who came floating down the Ohio in canoes or "broadhorns." For miles the Indians would secretly follow such a party, and then when their opportunity came would strike their deadly blow. When a boy of seventeen Tecumseh was in a party making an attack on some boats near the present site of Maysville, Ky. The boats were captured and all the people in them slaughtered on the spot except one person, who was spared and later burnt alive. The horror of the spectacle so impressed Tecumseh that he then and there said he would never again be guilty of such cruelty, and the vigorous manner in which he protested against it so moved his companions that they agreed with him to not repeat the act. This resolution Tecumseh never altered; time and time again he protected women and children from his infuriated followers. At the battle of Fort Meigs a party of Americans was captured by the British and Indians. Though they had surrendered as prisoners of war, yet the savages were firing into them promiscuously, or selecting such as they chose to tomahawk in cold blood. 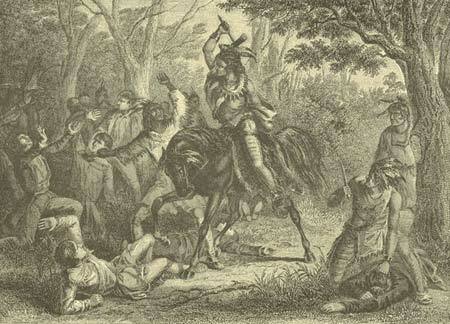 This dreadful scene was interrupted by Tecumseh, who came spurring up and, springing from his horse to the ground, dashed aside two Indians who were about to murder an American, threatening to slay anyone who would dare to injure another prisoner. Turning to the British General, Proctor, he asked why such a massacre had been permitted. 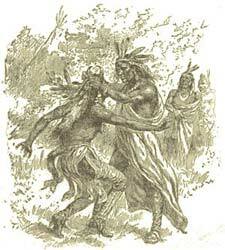 "Sir," said Proctor, "your Indians cannot be commanded." "Begone," was the angry reply of the outraged Tecumseh, "you are unfit to command. Go, put on petticoats." This was only one incident of many showing how far he was above the ordinary Indian in magnanimity of character. At the already mentioned Vincennes conference Tecumseh agreed with General William Henry Harrison--his unrelenting foe and who judged him as harshly as any of the frontiersmen who feared and hated him--that in case of an outbreak of hostilities the women and children on both sides were to be protected and respected. Certain it is that General Harrison would have made no such agreement had he not believed that his adversary would keep it. To understand the life and work of Tecumseh it is necessary to look into the history of his times. His career was embraced between the period of the Revolution and our second war with Great Britain. The destiny of the Great West was not then assured. Ohio and Kentucky were frontier States, vastly farther from the seat of government than is the most remote of our Western outposts to-day. They could be reached only by a toilsome journey over the Alleghanies and a trip down the Ohio. A journey to-day to the Yellowstone, or to the regions beyond the Black Hills, does not mean, in the way of time, danger, or adventure, one-tenth what a journey to Fort Washington (Cincinnati) meant in 1800. Indiana was a Territory, and the Territorial Governor, first of the Northwest, and then of Indiana, was William Henry Harrison, a born fighter, a palaverer, and who, in the difficult position which he occupied in dealing with unruly settlers on the one hand and turbulent Indians on the other hand, displayed singular tact and ability. He was eminently the right man in the right place. But in spite of the claims the United States made of the West, the country was but little known, nor was its real importance even suspected. That the Mississippi Valley would one day be peopled by millions, and be the greatest, wealthiest, and most productive part of the country, was not thought of even by the most sanguine of Americans. The Eastern States in those days had affairs enough of their own on hand, and the Western frontier was not regarded as essentially important. The national idea--the Nation with a big N, as recent humorous newspaper writers have put it--had not been evolved. It was difficult for even a man of the persuasive powers of General Harrison, to induce the General Government to furnish half enough troops to adequately guard the outposts. If there was serious work to do the settlers had to do it themselves. There was little grumbling over this state of affairs, however, as the Kentuckians and Westerners generally had been brought up to do their own fighting and not to wait for the Government at Washington to do it for them. In those days British agents were actively at work among the Northern Indians to keep them in a state of disaffection toward the United States. Meanwhile, the Indians were in the midst of the great tragedy that has been enacted since the days of Columbus. They were the victims of traders who sold them fire-water, and for poor and cheap weapons, demanded furs whose value was out of all proportion to that given in return. Many of their women married white renegades who corrupted the morals of the tribes. They were being dispossessed of the finest homes and best hunting grounds in America, for the buffalo was then found in Kentucky in great herds, and their position was thoroughly unhappy. They had then--and happily this is not wholly the case at present--no rights that a white man was bound to respect. But the Indians were still many and the settlers were few. To a great leader, who of course could not take into account the mighty force behind the Anglo-Saxon ranks that first marched over the Alleghenies, it would still seem practical to band the red men together in a vast confederation and drive the invaders back again beyond the Ohio and the mountains. This was Tecumsch's splendid plan. This was the design to which he devoted his life, and which he pursued with such ardor and genius as to do what an Indian had never before accomplished. Pontiac, it is true, at the siege of Detroit gathered a number of tribes under his leadership, but he never dreamed of a continental confederacy, as did Tecumseh. In this vast design he was materially aided by his brother, best known by the name of the Prophet, who, while lacking in judgment, was none the less a man of extraordinary force of character. He proclaimed that he had received power from the Great Spirit to confound the enemies of the Indians, stay the march of disease and death, and that he was the Messiah to lead his people to new and greater things. But as conditions to success the Indians must stop drinking fire-water, they must cease intermarrying with the whites or trading with them, and they must hold all things as the property of all. They must return to their original dress and manners, and forget that they had ever seen or known the "pale faces." The fame and influence of the Prophet spread with almost miraculous rapidity, and young men and warriors came from afar in crowds to receive inspiration from him. Tecumseh with rare ability turned this influence to advance his own plans. And of course this constant stream of visitors to his brother, enabled the chief to spread his racial idea far and wide. One of the things that Tecumseh maintained was that the Indians held the land in common, that no one tribe owned this or that territory, but that the Great Spirit had given it equally to all. This he said at the conference at Vincennes, but General Harrison ridiculed the idea and stated that if the Great Spirit had intended to make one nation of the Indians, he would not have put different languages into their heads, but would have taught them all to speak alike. Tecumseh bitterly replied that no one tribe had the right to give away what was the joint property of all, and not until the United States agreed to cease purchasing lands from the Indians and restored the lands recently bought, would peace be possible. Pointing to the moon that had risen on the council, Governor Harrison said that the moon would sooner fall to earth than the United States would give up anything fairly acquired. "Then," said Tecumseh, "I suppose that you and I will have to fight it out." But these councils ended in nothing except a manly and impressive statement by Tecumseh of his position, and a strong and terribly just indictment of the whites for their treatment of the Indians. Tecumseh was constantly on the move. Now on the Lakes, now on the Wabash, then on the Mississippi or the plains to the westward, then on the Ohio or the hills that roll to the south from it. Everywhere the Indians received him graciously. But an accident destroyed his plans, and one defeat dashed his confederation to pieces. During his absence Governor Harrison, alarmed at the gathering of warriors at the Prophet's town of Tippecanoe, on the Wabash River, in Indiana, marched against it. There was no necessity for a battle. It might easily have been avoided. Toward the close of day the Americans reached Tippecanoe. The Indians disclaimed any hostile ideas, and it was settled that the terms of peace were to be arranged the next day. That night, however, the Indians treacherously attacked the Americans. The conflict was fierce and bloody. The Indian braves were animated by the promises of the Prophet, who declared that they would be victorious and that he had rendered the bullets of the white men of no avail. During the battle he stood on a neighboring hill and chanted a war song, to further fill his warriors with courage and enthusiasm. But though the red men fought gallantly, they were doomed to defeat. They were scattered up and down the Wabash, their town was burnt, and the power of the Western Indians was by this one blow shattered. So complete was the victory and so far-reaching in its effects, that General Harrison at once became the popular idol, and the glorification of the battle of Tippecanoe, a generation later carried him into the Presidential chair. It was this battle that gave the West to the whites. As for Tecumseh, he returned suddenly from the West to find that despite his commands, the Prophet had permitted a battle. In his rage and disappointment he took his brother, now fallen and disgraced, by the hair and shook him. But no longer was it possible to hold his tribes together. The victory of the United States at Tippecanoe took the ardor for battle and resistance quite out of them. There were hundreds of them, however, who in the war of 1812, which broke out immediately, followed Tecumseh into the British service, in which he was commissioned as a major-general. In that service he was doomed to continued disaster. The English commander. General Proctor, was incompetent and, in all the qualities of real manhood, the inferior of his savage ally. After the battle of Put-in-Bay, on Lake Erie, he started to retreat. Tecumseh protested, and was induced to go on only by the promise that winter supplies would be delivered a few miles up the Thames. It was on this stream that Proctor finally determined to make a stand, but at the outset of the action he, coward-like, retreated with his red coats, leaving the Indians to bear the brunt of the battle. Tecumseh had gone into the fight saying that he would be killed, and his prediction was verified. But how he died no one can say with certainty. No less than four Americans claimed the honor of having killed him. Among the slain, in that time of fierce pursuit and confusion, his body was not even identified. But there it was, on the banks of that quiet Canadian stream, some thirty-five miles from Detroit, that the greatest Indian in statecraft, diplomacy, devotion to his people, and in dignity of thought and intellectual gifts, found his unmarked grave. No one yet has written a biography of him that does full justice to his great abilities and lofty character. But his name is the most familiar of all Indian names, and he is the only Indian after whom Western fathers and mothers have ever named their sons. The late General of the United States Army, William Tecumseh Sherman, bore his name, as have hundreds of other boys born in Ohio, Kentucky, and the great States that roll westward from them.